New Orleans Cuisine: Happy Mardi Gras! Yes, in honor of Mardi Gras I'm going to do a section on Gumbo tommorow, specifically, Creole Gumbo! Since tommorow is Ash Wednesday, for traditions sake, I should be doing Gumbo Z'Herbes, but hey, what can I say. 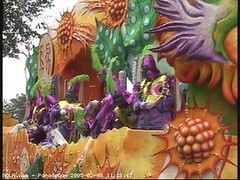 Anyway, Happy Mardi Gras, party it up folks, because come midnight, the magic is over. Until next year that is!